An uplifting and interactive blend of art show, storytelling and dynamic discussion. See your life path in a new way! Using a series of artworks to explore the seven stages of spiritual growth symbolically described in the sacred text The Seven Valleys of Baha'u'llah, profound concepts are approached in a fun, interactive and down to earth way, encouraging personal associations and new insights. To book this event contact Jacqueline. For more information read on…. 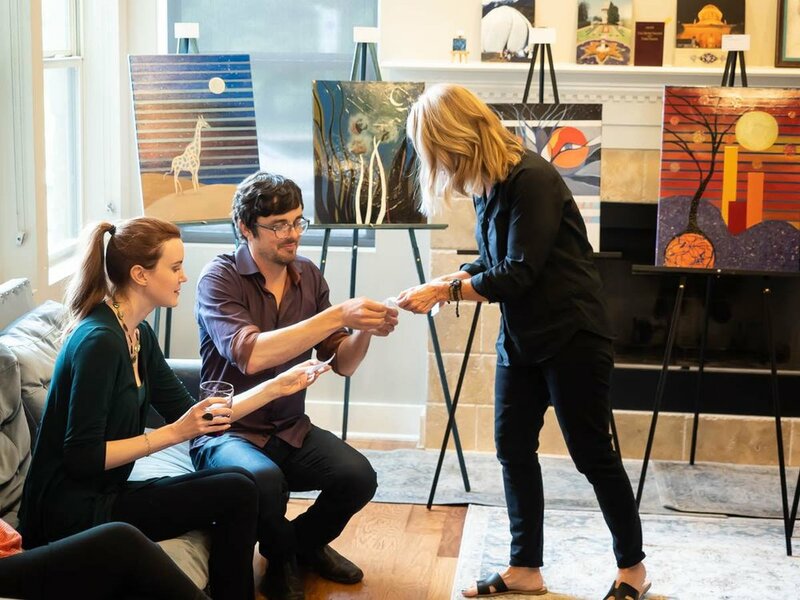 I usually allow :30-:45 minutes for folks to arrive as they would for a traditional art reception - but it's exceptionally welcoming and I invite them to participate in an icebreaker that connects them with the art and each other and will come in to play later on during the talk. Then I give a talk about the series and the mystical story of "The Seven Valleys" and the audience is prompted to share their thoughts - we all learn from each other. Total this portion is about :45 minutes, as well. A few years ago in California I wanted to do something creative for my birthday. I decided to share my art and invent an icebreaker to help new people get to know each other, discuss big cool ideas (instead of being stuck in small talk zone) and engage with the artwork. You can read about the party here and the repeatable tips I learned here. Then, I revisited this concept but took it up a notch, creating an immersive art birthday experience in the same river side location where I painted my series The Seven Valleys of Summer. You can read an in the moment reference to it in this blog post. Then I just kept going… Looking forward to where this path leads!